Your private parts are delicate and sensitive, so you definitely don’t want to be using potentially dangerous sharp objects when shaving already sensitive areas of your body. However, with that being said, you probably want to engage in some private area landscaping. Too much hair down there might not be the most attractive thing, but you don’t want to be using scissors in the area below the bikini line. Today we are here to help you find the best body groomer for private parts, one that will get the job done without making things uncomfortable or causing injuries. This might not be the newest version of this item on the market, but it is fairly inexpensive, it is quite durable, and it certainly lets you trim your private parts without fear of injury. It’s simple and effective, which is exactly what we want. For one, the extra-long handle on the Philips Norelco Bodygroom Series 3100 makes it easy to reach hard-to-get-to places. It’s a good option for tight spots, plus it makes a good back grooming tool as well, thanks to the back grooming attachment. This groomer is also built to be ergonomically friendly; it is comfortable to hold, so you don’t slip while trimming those important parts. The Philips Norelco Bodygroom Series 3100 comes with a special blade guard to help ensure that you don’t cut or nick yourself, while still being able to cut away those stubborn hairs. It works well for both long and short hairs, plus it comes with 3 different comb attachments for different length trims. The attachments are really easy to switch, which is a boon no doubt. The Philips Norelco Bodygroom Series 3100 is a cordless groomer, which means that you don’t have to deal with any power cords. An 8-hour charging time will provide about 50 minutes of use; it comes with the charging station included. This groomer also comes with a 2-year warranty in case something breaks. For one, we like how the Philips Norelco Bodygroom Series 3100 is made for sensitive areas and has a special guard to prevent cutting. Also, we think that this thing has more than enough power, plus the necessary attachments, for all private area grooming needs. At the same time, we appreciate the cordless design, and the ergonomic design helps make things easier. The only bad thing that we can see about the Philips Norelco Bodygroom Series 3100 is that the battery life is comparatively short when looking at how long it takes to charge. Gillette is a well-known and highly trusted brand name, one that always creates great products such as this Gillette Fusion ProGlide Groomer. It works great for private parts and is not even that expensive. For one, the Gillette Fusion ProGlide Groomer is ergonomically designed with user friendliness in mind. It is very slim and compact, making it very easy to maneuver in tight areas such as around your private parts. The handle is made so that it has good grip and is easy to hold, thus making it much harder to injure yourself. Also, the Gillette Fusion ProGlide Groomer comes with a special blade and guard design which makes it impossible to cut yourself at all, a bonus when it comes to your private parts. This feature, plus the really sharp and precise blades, make this particular groomer more than ideal for areas where the skin can be quite sensitive. The Gillette Fusion ProGlide Groomer has a totally waterproof design. 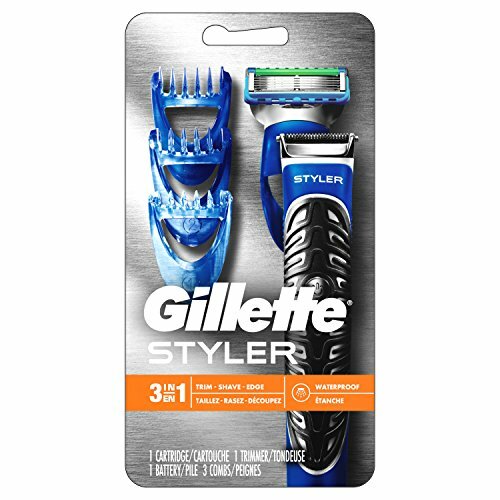 The Gillette Fusion ProGlide Groomer comes with 3 comb attachments of various lengths for your styling needs, plus it also comes with a ProGlide razor cartridge. This groomer works just as well for your face and other areas of your body as it does for your private areas. This is also designed for precision trimming. For one, we like how the Gillette Fusion ProGlide Groomer is cordless because it means not having to fiddle with power cords. Battery life aside, we like this feature. We also like how the blade guard prevents any part of your body from being cut. The blades are really sharp and they last a long time, making it quite economically efficient too. All in all, we really like the Gillette Fusion ProGlide Groomer for pretty much all of the features it comes with. The only thing that we really don’t like about the Gillette Fusion ProGlide Groomer is the same thing we did not like about the first product we reviewed; it just does not have very good battery life. This might not be a well-known brand name, and the groomer itself might look a little funky, but it certainly gets the job done, plus it works pretty well too. First and foremost, the shock absorber pads allow the MANGROOMER to move with the contours of your body for a clean, close, and safe shave. It has a special blade to help minimize cuts. 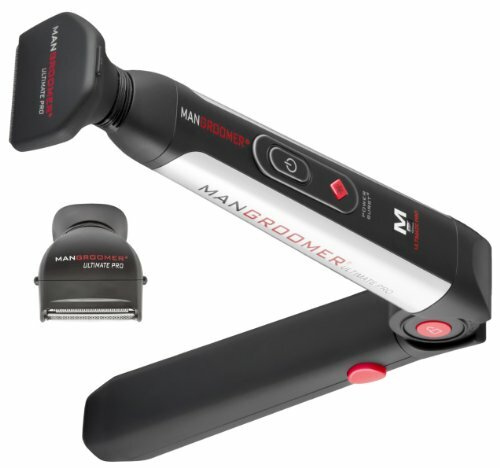 The MANGROOMER does not come with any combs or length adjustment capabilities, but it is definitely a good option for cutting shorter hairs and for precision work. The long ergonomically designed handle provides a good grip, is easy to hold, and makes the MANGROOMER great for getting into tight places. It features an ultra-wide blade with an extendable handle for back grooming, and a normal blade for everything else. This groomer features a really short charging time with a fairly long battery life, plus it has a charge indicator light as well. We like how the MANGROOMER tells you how much battery life is left, and that it quickly charges. 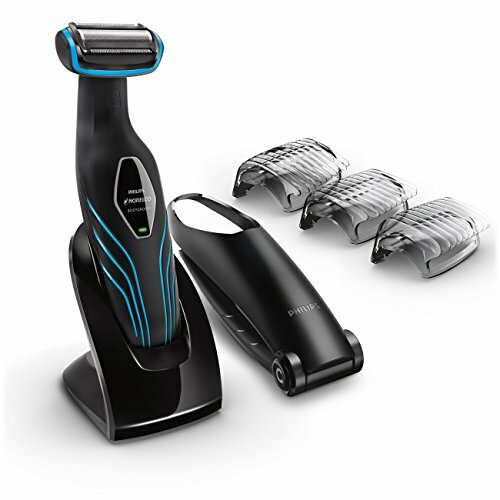 Its ergonomic design makes it easy to reach hard-to-get-toareas; the blade is meant to prevent cutting; and the shock pads help the trimmer to move with contours. All of these things are great in terms of grooming any areas of your body. We don’t like how the MANGROOMER doesn’t come with different combs. Also, the bulky handle can be a little hard to get used to. It is not the best tool for shaving off longer hairs. Our overall top pick is the Philips Norelco Bodygroom Series 3100 and it is because it is durable, comfortable to use, comes with a few attachments, and works well for private parts. We also like the Gillette Fusion ProGlide Groomer as a second choice.